Looking for a fun and free, family oriented, creative opportunity? Then join us on Saturday morning, August 12 at the Carnegie Center as our instructors teach you and your children how to make a “Cloth Critter” soft sculpture. Our “2017 Form, Not Function: Quilt Art at the Carnegie” will be up in our galleries and this fiber project is a good introduction to making something out of cloth. We will show participants how to transform an ordinary washcloth into something fun and unexpected. 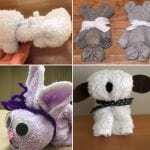 The Carnegie Center will supply all the materials you will need to create your own soft bunny, teddy bear, or any other animal that inhabits the imagination of a child. Our Family Fun Workshops are free, however, we do request that you register in advance if you would like to attend. This can be easily done by emailing Delesha Thomas at dthomas@carnegiecenter.org or by calling the Carnegie Center at (812) 944-7336. We also ask that parents or caregivers remain with their children at all times while in our building. Please plan to arrive before 11:30 AM to have enough time to complete this project. Suggested age ranges for this project are two to twelve years of age. Complete this make it, take it, and stay and see our wonderful quilt exhibit.